We humans are (mostly) a social breed. Ever since we have been able to connect computers together, we have enjoyed using our computers to communicate with each other. These days it’s hard to imagine a life without computer messaging such as email, IM and other applications that let us communicate cheaply and over great distances. 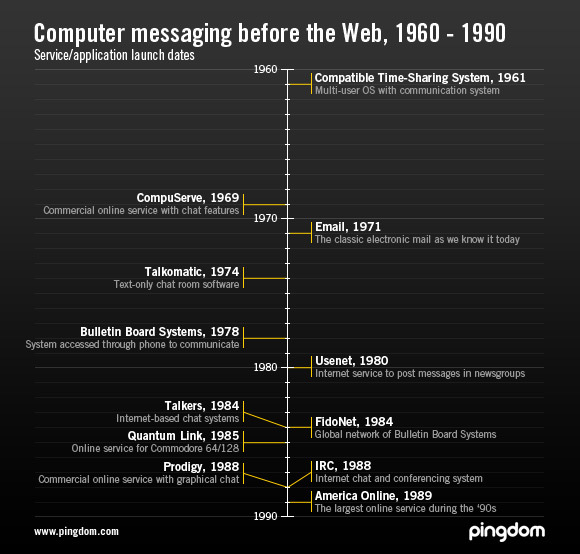 We decided to take a look at the history of computer messaging, the technologies and services that ultimately led us to where we are today. Our focus has been on electronic messaging from one computer user to another, pre-Web. So forget about the telegraph and other inventions that don’t involve ones and zeros. Let’s dive right in with this timeline we’ve put together with different ways people have communicated using computers, from the early days in the ´60s until the start of the Web in the early ´90s. Some of the above systems aren’t that well known anymore so let’s go through them one by one. The Compatible Time-Sharing System, or CTSS for short, was developed at MIT’s Computation Center. It was one of the first time-sharing operating systems which let several users share one mainframe computer and its resources. CTSS was one of the first systems to include user-to-user communication functionality, much like we use email today. CompuServe was the first major commercial online service that was available in the US. It was a huge network with various resources that you could connect to, kind of like a crude predecessor to the Web. The service declined in popularity during the ‘90s as the Internet grew more popular. The service had discussion boards, chat rooms and electronic mail which users had access to. Although email had been around in different forms on time-sharing mainframe computers it wasn’t until 1971 it began to look the way it does today. It was then Ray Tomlinson came up with the idea to separate the name of the user and the machine with an “@” sign. Email grew to become the killer app of the ARPANET (the forerunner to today’s Internet). Talkomatic was developed in 1973 by Doug Brown on the PLATO System (a system for computer-based education). The software was like a chat room with windows displayed for each logged-in user. Anything a user typed was instantly transmitted so all users could see each other type. By many it is seen as the original text-only chat room. Bulletin Board Systems, BBS for short, made it possible for people to set up modem-connected computers that others could dial into and gain access to via a terminal. The BBS software had functionality for leaving messages to other users, upload and download files and much more. The BBS was run by an administrator called Sysop and often the BBS was just someone’s home computer which he granted others access to, but in other cases the BBSs were huge systems with multiple phone lines and some were run commercially. The first BBS software was developed by Ward Christensen during the great blizzard of 1978 in Chicago. Usenet was and still is a service on the Internet where users can post messages (news) into categories called newsgroups. It was developed at University of North Carolina at Chapel Hill and Duke University during 1979 and became publicly available in 1980. FidoNet was created as non-commercial network in 1984 by Tom Jennings. It’s a worldwide network used for communication between different BBSs. Thanks to FidoNet, BBS users could send messages all over the world by connecting to a local BBS. FidoNet is still running today but is considerably smaller than during its peak in the ‘90s because many BBSs have been closed down after the Internet became popular. Talkers were chat systems that allowed people to talk to each other over the Internet. In many ways they were the predecessors of today’s instant messaging applications. By logging in to a talker system (often through telnet) users could connect to a text-based chat room and talk to other logged-in users. Talkers were like MUDs (länk) but just with the chat function and no gaming. Quantum Link was an online service for the Commodore 64 and 128 computers. The service featured electronic mail, chat rooms, instant messaging and much more. An interesting fact is that Lucas Arts’ famous SCUMM game system got its start as a graphical chat in Quantum Link. Quantum Link was later renamed and became America Online (AOL). Internet Relay Chat, or IRC, is a real-time Internet chat and conferencing system. Users connect to channels to discuss different topics and it’s also possible to communicate one-on-one. IRC is still today a very popular way of communication over the Internet. Prodigy, launched in 1988, was an online service similar to CompuServe. By 1990 it was the second-largest online service provider after CompuServe. Unlike CompuServe, Prodigy had a graphical user interface instead of a command line interface which made it easier to use. The service also pioneered the concept of online communities. America Online, or AOL, grew out of the previously mentioned company Quantum Link. After it had launched its service for Commodore 64 and 128 the company went on to launch services for the Mac and the PC called AppleLink and PC Link. The company changed its name to America Online in 1989. AOL grew to become the largest service provider during the ‘90s. These were some examples of computer messaging over networks during the early days before the invention of the World Wide Web. Some are alive and well even today. One has to have experienced the speed (or rather the lack thereof) of connecting to a BBS in the old days and the excruciating wait for the text screens to transfer to really appreciate the speedy applications and interfaces we have today. Next week we will continue our journey through the history of computer messaging by looking at software and systems released during the ’90s until today, i.e. during the era of the World Wide Web. Ah, bulletin board systems! Fond memories! I do not believe CompuServe had discussion boards, mail, or anything like that in 1969. It was years before they added that functionality. Talkomatic was created and went live in 1973. You even say so. In the writeup above. So: why do you list Talkomatic as 1974 in the timeline? I assume this is a simple error? Could it be corrected? Oh, also, PLATO Notes was created in August 1973. Notes was one of the first conferencing/message-board systems. Surprised not to see this in your timeline. PLATO’s email system launched in early 1974 and was called “Personal Notes”. FYI, Lotus Notes is named after PLATO Notes. Talkomatic came out in 1973 on PLATO. As did TERM-talk (PLATO’s instant messaging, December 1973) and PLATO Notes (group message forums, in August 1973). Then of course came Personal Notes (PLATO’s email) in early 1974, as well as News Report, the world’s first online newspaper that users could submit stories to, and also had reporters and editors for. Pingdom owes its readers a correction to the article and especially to the timeline graph in the article.